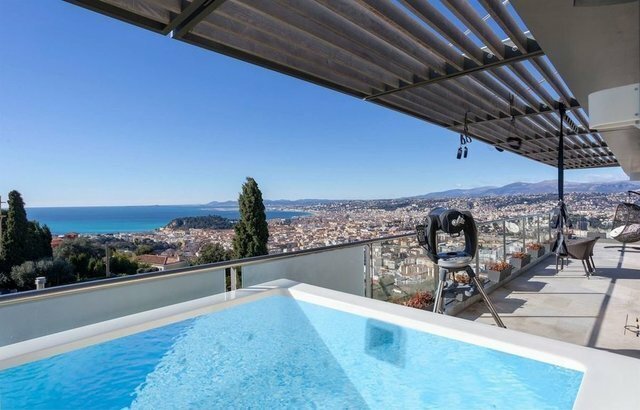 For sale, a Luxury penthouse situated in the Mont Alban hills of Nice in a private gated domain. This luxury duplex apartment offering 265 m² of living space finished to the very highest standard. In the exclusive "Parc de Blanche des Castilles" a secure residence with 24hr security. The apartment in a low level block sits in landscaped gardens and olive groves and framed by the back drop of the National Park behind. From the apartment's many terraces and balconies you have breathtaking panoramic 360° views from the Bay of Angels, the peninsula of St Jean Cap Ferrat, the city of Nice and the mountains beyond. The apartment which has been decorated and furnished to very high quality throughout, composes of a spacious and very luminous living/dining room which profits, thanks to the large floor to roof bay windows stretching the length of the room. Just off the living is an independent fully equipped modern kitchen. This apartment also has 4 en suite bedrooms, a laundry and exceptionally, a home cinema. On the main terrace you can dine in the evening “Al Fresco” from your BBQ and enjoy a glass of champagne whilst sitting in your jacuzzi and profit of the Laminations of Nice by Night. The penthouse is benefiting from smart home system, alarm and phone entrance system; It comes with garages in the underground car park, with direct access by elevator to the apartment. The residence has full camera security and guardian and has a large coded entrance gate. Within the domain there is also a large communal swimming pool.